… is, apart from Go Fish! one of the most beloved children’s card games. In language learning we can use like any other pais matching game that focuses on matching a picture card to another picture card, a picture card to a text card or a text card to another text card. The game is played with a deck with an odd card number, where the card that can’t be matched acts as the „Old Maid“, „Schwarzer Peter“ or „Donkey“. All cards are distributed among players. The players discard the pairs they have and continue playing by drawing a card from the opponents hand and discard it if they can pair it to a card they already have. The game continues until one player, the loser, is left with only one card in his hand that can’t be paired. You can use this PetraLingua Old Maid Game Template to create your own set of Old Maid cards, to practice whatever topic you want. A great thing about kids preparing their own playing materials is that we can always use this for extra learning and practicing, already while they’re drawing or coloring their cards. 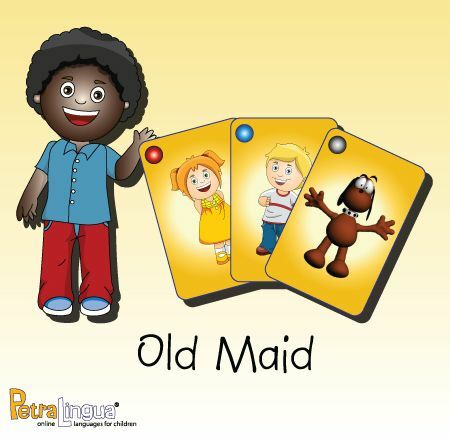 Print out this version of the Old Maid game to repeat your adjectives!